Mari-anne Hof arranged her trombone quartet Retrograde for four hands, one piano duet. It was the first piece that was selected for sight reading at the Piano Soiree in San Francisco in May 2011. As I cycled westbound from central Utrecht in the late afternoon, I passed by the annual Festival de Parade near the train station. It reminded me that exactly this time last year I had gone to see the premiere of a new opera with my composition classmate Mari-anne Hof. I had told her that I could get us both press tickets if she would translate my review into Dutch, hence published in Le Bon Journal: “Ricciotti Ensemble premieres Pinocchio in Love” in English, and De premiere van Pinocchio in love van het Ricciotti Ensemble in Dutch. Mari-anne Hof created a 4-hand one piano duet out of her trombone quartet entitled Retrograde. She sent me the midi version to ask if it’s not too hard to sight read for the Call for Scores of Multi-hand Piano Duets project. It sounded easy, if played more slowly. The score is nicely laid out and easy to read. There are rehearsal markings from A to K, which, in addition to the bar numbers in each system, make it easy when rehearsing with the other player. Given the 7 pages, it’s important to discuss which player will do the page turns. In fact, I’d like to request all composers to lay out their scores to enable performers to turn pages easily. Reading a piece is already challenging enough, without having to figure out the page turns. Now compare the midi version below with the recording of my version with Brendan Kinsella. Ours was much slower though we did try to follow the metronome marking of quarter note = 130. 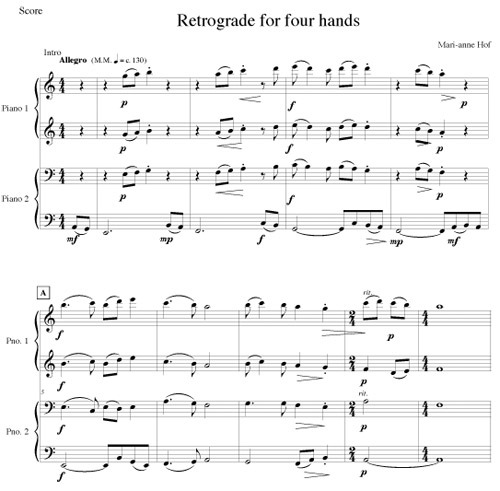 Retrograde was the first piece I selected for the sightreading workshop I conducted in San Francisco in May 2011. I thought I’d start with the easiest piece, but my judgment was wrong. It wasn’t so easy for the two sightreaders. One fell behind and played with just one hand while the other struggled to keep the rhythm going. I thought they would give up at some point, but they persisted. I can’t say it’s enjoyable to listen to people sightread when we are so used to polished performances of pieces we’ve studied. What next? I would love to hear what the original trombone quartet sounded like! I should cycle by her house before I leave Holland for Hawaii next month!